← Drivers for Jarvis • Batch #3! The first DNA award goes to…..Pemberton, BC! 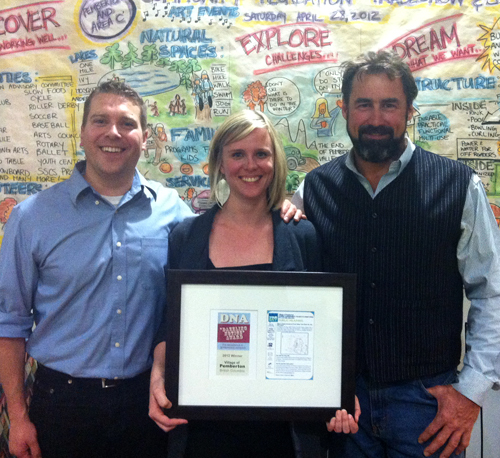 Village of Pemberton CAO Daniel Sailland, Communications Coordinator Jill Brooksbank & Mayor Jordan Sturdy. A few years ago, I noticed that Toronto’s public notice ads were terribly designed. In fact, they aren’t ‘designed’ at all. There is no use of colour, or images. It’s all text, with a tiny tiny font. The most important details are buried in a mountain of information, and there’s no pro-active ‘call to action’ to encourage participation. In a 2010 TED talk, I highlighted Toronto’s notices, and described them as ‘intentional exclusion’. Ten months ago, I took it one step futher. I invited designers to re-imagine our municipal development notices, and three months later we released the submissions we had received. It was great to see the amazing conceptual designs produced by local artists and designers – but the next step was to wait and see if any municipality in Canada would respond to our recommendations and redesign their real notices! 1) They used colour. Five different colours, in fact. Colour is a wonderful tool that is used in almost all marketing and outreach design. It’s attractive, and catches people’s attention. 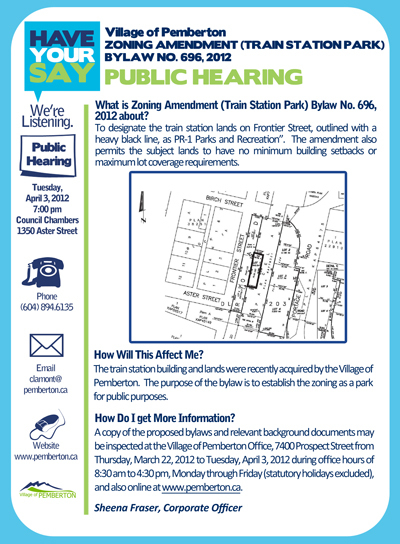 2) The property being discussed “Train Station Park” is highlighted right at the top, in clear bold letters. 3) The most relevant information is clearly highlighted. 4) The engagement process is very clear and simple. 5) Most importantly, they ASK for input and encourage participation. So, it was with great pleasure that I traveled to BC last week, and presented both Jill Brooksbank, and mayor Jordan Sturdy with the first DNA Award. Municipalities should be rewarded for making genuine efforts to engage the public in local decision-making. Participatory democracy requires a lot of effort, and it’s always easier to simply exclude the general public. This award was well-deserved for Pemberton. Which city will be next?…. This entry was posted in Community Organising, I Have Too Much Time on my Hands, The Fourth Wall, Uncategorized. Bookmark the permalink. Great to see a municipality actually taking your good ideas to heart and acting on them! I’d love to see Vancouver City Council follow suit. Have they ever been in touch with you? I’m going to forward this post to the mayor and council. The artist’s name is Erin Steward Elliot. Cool – I know Erin – she’s great! Thanks for getting back to me. My name is Rosa Bustamante and I’m a planner at the City of Burlington. I saw your TED Talks video in early 2012 and emailed it to our Planning Department to get some feedback on it. By April, we had a new template for neighbourhood meetings and in May 2012, we began using it. 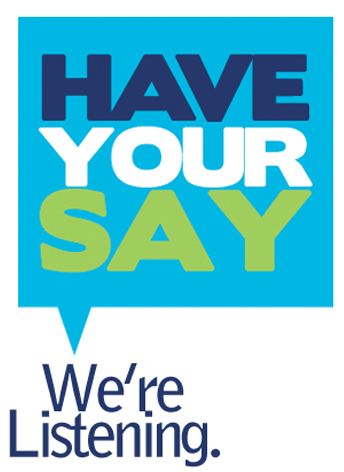 Since then, we’ve received lots of positive feedback from councillors, other City staff and members of the public. 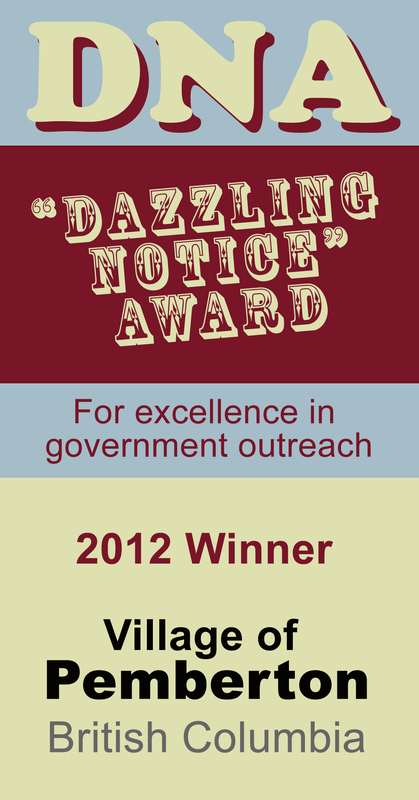 We anticipate that the notice will get revamped again in the future, but our current version is a good starting point. Thanks for the inspiration! I can’t attach an example of the notice in my comment, but I’ll email you one so you can see some of the progress that’s been made in a municipality a little bit closer than Pemberton, BC.